Ready to sign up? Now imagine that you also decide to take a practicum called “Principles of Lybrarianship.” On your first class meeting you learn that each student must plan and execute a time-traveling mission to assist or rescue an individual or organization whose thoughts, ideas, or opinions are in danger of being suppressed. Rescue mission? Time-travel? Lybrarian with a Y? 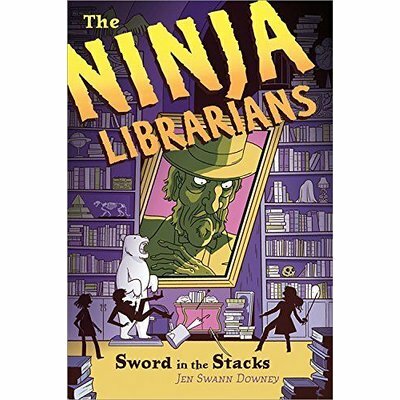 Welcome back to Petrarch’s Library in Jen Swann Downey’s latest installment of the NINJA LIBRARIAN Series. In THE SWORD IN THE STACKS, 12-year old Dorrie Barnes finally gets her wish to become an apprentice in Petrarch’s Library, headquarters of the Lybrariad—a secret society devoted to protecting the written word in all forms through all time and history. As a lover of the first Ninja Librarians book, THE ACCIDENTAL KEYHAND, I’ve been as impatient as Dorrie to return to the marvels of Petrarch’s Library. It was well worth the wait. In this second volume, readers are fully immersed in the eccentricities and lushness of this magical library, in the daily lives of the apprentices, and in Dorrie’s quest to prevent the library’s ancient nemesis, the Stronghold, from getting a foothold in the past and rewriting history. As always, Downey’s writing is fun and funny. The dialogue snaps and crackles like the cheery fire in the apprentice’s common-room fireplace. The plot has more twists and turns than Petrarch’s Library with its turrets, towers, and tunnels. There’s a ghost library, a lizard named Darling, and a daring camel trek across the Sahara Desert. The characters and situations are solidly Middle Grade. Readers young and old will find themselves laughing out loud. They will also find themselves in 1919 London on a challenging, and timely-for-our-times mission. About midway through the novel, Dorrie and best friend Ebba are dismayed to learn that their mission for the “Principles of Lybrarianship” practicum involves preventing the disappearance of the Anti-Suffrage Review, a publication distributed by the National League for Opposing Woman Suffrage—an organization that worked to prevent women from getting the right to vote in the United Kingdom. This organization really existed. Dorrie and Ebba are outraged. They believe that all woman everywhere should have the right to vote. They don’t want to help people who hold a view completely opposite to their own. But that, according to Head Lybrarian Hypatia, is precisely why Dorrie and Ebba have been given this mission. Protecting the right to free speech and the written word means protecting all free speech and all written words, even—and perhaps especially—those texts with which we disagree violently. Even those texts that we may wish had never been written. Dorrie and Ebba’s rescue of the Anti-Suffrage Review is a subplot (that ends up intersecting beautifully with the main plot) but it holds the heart of the story: the right for all stories, for all histories, for all ideas to co-exist. Sticking up for someone’s right to express an opinion you personally abhor is hard. Slipping into someone else’s skin, opening yourself up to different perspectives and viewpoints is even harder. But that’s what Downey’s Lybrarians do on every mission to a different time/place/culture. Fantasy novels are often a great way for readers to think through difficult issues in the real world. Are you looking for a way to talk to your children or your students about freedom of speech and expression? About the conflicting ideas and viewpoints that uneasily bump shoulders in today’s news, such as the rise of Donald Trump and the surprising Brexit vote? Dorrie and Ebba’s next mission could well be to make sure that people have access to everything written about these polarizing current events. I definitely recommend THE SWORD IN THE STACKS to lovers of adventure stories, to readers who want to be immersed in new worlds, to boys and girls who want to read kid characters from diverse times, places, and ethnicities, and to people who love a good story that makes them think. We need middle-grade characters like Dorrie and Ebba. We need their adventures, but even more, we need the tricky, sticky problems they face when one is charged with protecting the free transmission of all ideas. Carolyn Fay writes fiction and non-fiction for children’s magazines, including Highlights for Children, Dig into History, Muse, and Boys’ Quest. She is looking forward to signing up for Spears, Axes, and Cats: Throwing Objects with Precision and Flair as soon as she can stumble her way into Petrarch’s Library. Find her online at http://www.carolynfay.com or on Twitter at @feecaro. This looks like a really fun book! I’ll need to check it out. Since I’m going to be working in an elementary school (up to 5th grade), it sounds like a good book for the upper grades. Thanks for an exciting introduction to a book I’m sure all my middle school grandchildren will like!